At Watson’s we are always talking about the importance of proper soil preparation. Preparing your soil with compost and a starter fertilizer is the easiest way ensure your fall plantings will not only survive, but thrive in the coming years. Compost adds organic matter to your soil, which greatly improves the ability of soil to retain water and nutrients, and helps soil particles bind together to form structure, in which water, air and roots can move freely. It also feeds beneficial soil microbes and fungi which in turn break down and transport nutrients to the roots. E.B. Stone's special blend of ingredients are combined to make this an all-purpose outdoor planting mix. This Planting Compost is blended for use in all soil types and for all types of outdoor gardening. Contains: Composted Wood Shavings, Redwood Compost, Composted Chicken Manure, Mushroom Compost, Fir Bark, Bat Guano, Kelp Meal and Alfalfa Meal. For Best results, never plant anything without E.B. Stone Sure Start. E.B. 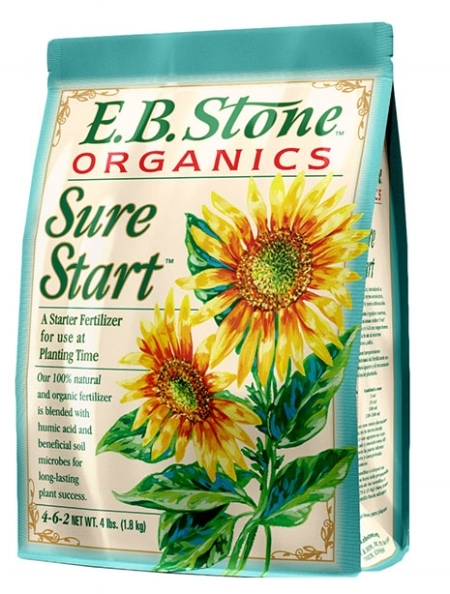 Stone Sure Start is a blend of natural organic ingredients formulated to help newly transplanted plants develop strong roots and sturdy growth. Sure Start is rich in natural sources of phosphorus to help your plants develop a strong foundation for future growth. The gentle and non-burning formula is safe to use with even the most tender transplants. Contains: Blood Meal, Feather Meal, Bone Meal, Dried Chicken Manure, Bat Guano, Alfalfa Meal, Kelp Meal, Potassium Sulfate, Humic Acids and Soil Microbes including Mycorrhizal Fungi.